Home Entertainment ANOTHER SAD NEWS: Nollywood Actor & Comedian, Oliver Duke Dies In Car Accident. ANOTHER SAD NEWS: Nollywood Actor & Comedian, Oliver Duke Dies In Car Accident. 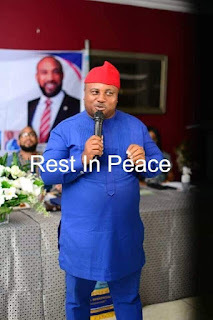 The entertainment industry in Nigerian has again been thrown into mourning as one of their own, Oliver Duke, popularly called, Linchung is announced dead. Linchung was a comedian and actor and in recent times, featured very prominently on DO GOOD, an African Magic drama series, which s produced in collaboration with Veteran Basorge Tariah. The late Comedian was said to have died in a car accident yesterday, the 2nd of April on his way from the South-South where he had gone to bury his mother and on his way back to Lagos, met his death. Highly hilarious and friendly, Linchung was a very lively person in whom there was no guile.